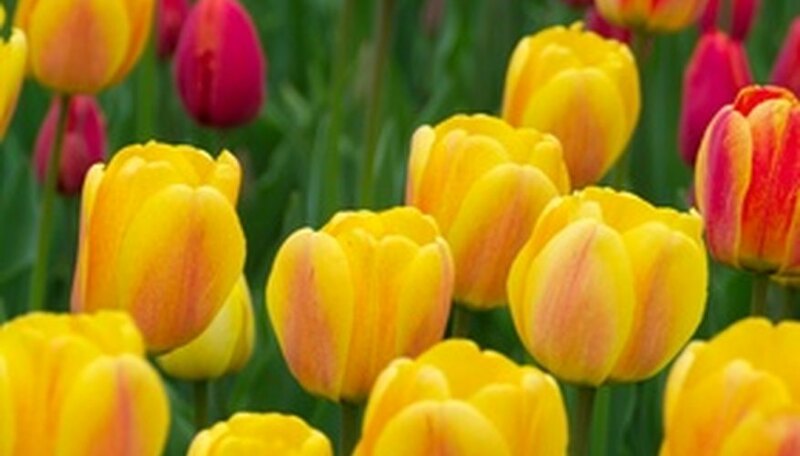 Tulips by themselves make colorful and showy displays in spring, but using other spring-flowering annuals, bulbs or perennials helps amplify the visual splendor. Choose early-, mid- and late-season tulips for many weeks of flowers across springtime so you get flushes of different colors in the garden. Use companion plants that appreciate cooler temperatures around early-season tulips like species-types, and those that bloom more in warmer temperatures around the late-season types like parrot tulips. Lower-growing spring bulbs that flower the same time as tulips can create a colorful, contrasting backdrop to the tulip buds. After you plant your tulip bulbs, masses of more shallowly planted spring bulbs that emerge at the same time in spring. Brent and Becky Heath, owners of a large bulb company in Virginia, mention that good companions for early season tulips include glory-of-the-snow (Chionodoxa spp. ), squill (Scilla siberica), dwarf iris (Iris reticulata) and star flowers (Ipheion spp.). Later spring cohorts like grape hyacinth (Muscari spp. ), late-season daffofils (Narcissus spp.) and bluebells (Hyacinthoides spp.) make good choices, too. Cool-season annuals either planted in autumn or early spring can carpet the bare soil area where you expect your tulips to soon pop up. Pansies and violas (Viola spp.) come in such a broad array of colors that you can match or contrast the expected colors of the tulip blossoms for a heightened color effect. Other annuals to grow around tulips include ornamental cabbage, wallflowers (Erysimum spp. ), snapdragons (Antirrhinum spp.) and forget-me-nots (Myosotis spp.). Many hardy perennials bloom at the same time as tulips. Lenten roses (Helleborus spp. ), creeping phlox (Phlox subulata), columbines (Aquilegia spp.) and bleeding hearts (Dicentra spp.) may act as tall background plants or, in the case of creeping phlox, as a foreground mat or edging. Spurges (Euphorbia spp.) often bear green or red-tinted foliage and puffy clusters of yellow or chartreuse flowers that create a soft, contrasting texture to the coarse tulip foliage and singular upright stems. In areas where tulip bulbs perennialize well in cool soil, gardeners often have hosta growing in tulip beds, since the hosta leaves mask the maturing tulip foliage. Does Weed-B-Gon Kill Tulip Bulbs in the Ground Under the Weeds? Should You Cover Tulips From a Frost?